The RFID wristband is fast becoming the method of choice for access, payment, & social media integration at many major festivals, events, & venues across the world. How does the RFID wristband work? The beauty of the RFID wristband is that it needs no batteries, & is instead powered when it is tapped or placed very close to an RFID reader, which reads the passive tag inside the wristband. The RFID wristband can be linked to a users credit/debit card, enabling them to pay for goods or services with a tap of the wrist. This system benefits both user & organiser as there is no cash to deal with or transport, no cards to lose, & much shorter time spent queuing & paying for goods. Rather than having a traditional ticket or even an E-ticket on your smartphone, the RFID wristband enables a user to enter & exit a venue with ease, which drastically reduces both queuing times, & the need for as many staff to man the entrances. The RFID wristband also helps to eliminate fraud, & the instant information for the organiser enables them to accurately ascertain attendance figures. The RFID wristband can be linked to a users social media account, enabling them to share their experience with friends, family, & the world. The organiser also benefits from this integration as the ‘tweets’ & ‘likes’ are creating brand awareness to a global audience. 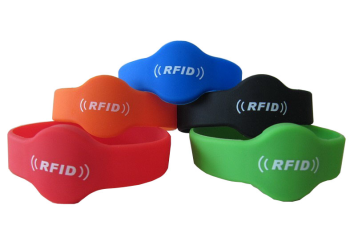 The standard RFID wristband can be made from silicone, PVC, tyvec, paper or polypropylene & is suitable for a multitude of uses such as festivals & concerts, nightclubs & bars, leisure & theme parks, venues & arenas, county shows & fairs, exhibitions & conferences. EM1200, EM4305, TK4100, MIFARE® S50/S70, MIFARE Ultralight® 10, MIFARE® DESFire® 4k, ICODEE2, FM11RF08, GT23SC4430. The waterproof RFID wristband is made from silicone & is an irregular card embedded with a contactless chip (LF, HF), which is then encapsulated into the wristband by ultrasonic plastic welding. 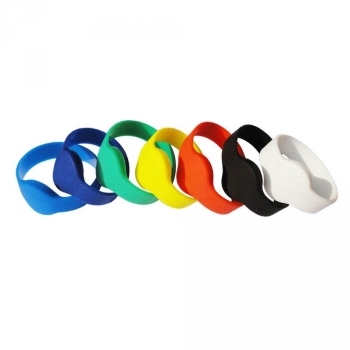 The wristband is highly waterproof and harsh resistant. 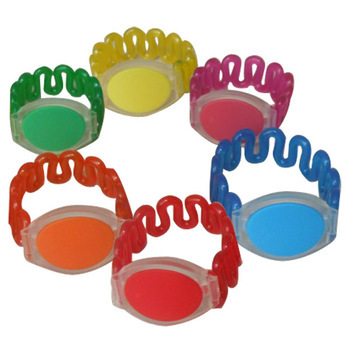 The waterproof RFID wristband is widely applied in pools, waterparks, spas and other RFID access control applications where a waterproof wristband is required, & they have a rating of IP67, IP68. 125KHz – EM4200, EM4305, TK4100, T5557. 13.35MHz – MIFARE Classic® 1K/4K, MIFARE Ultralight®, MIFARE® DESFire® 4K, ICODE SLI, Tag-it 2048.